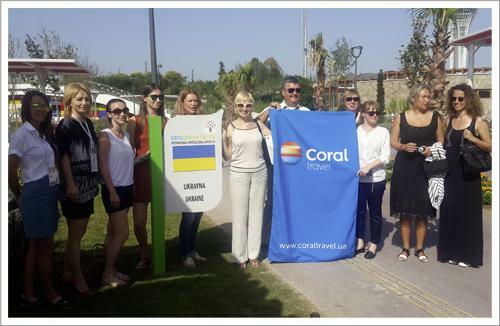 One of the market leader and pioneering tour operators since 2008 when it began to operate in Ukraine, Coral Travel has entertained Ukrainian journalists in Xanadu Resort High Class hotel in Belek, Antalya. In the press conference held with the journalists, Coral Travel Ukraine said that they have achieved 165% increase in the early reservation sales for Turkey and Spain in the first quarter of the season, and that they targeted 70% growth in the year 2016. Invited to Xanadu Resort Hotel birthday party celebrated every June 1, the Ukrainian journalists got together with Coral Travel Ukraine Director Tatiana Prokopenko. Prokopenko said that they have achieved 165% y-o-y increase in the early reservation sales for Turkey and Spain. The year 2016 target of Coral Travel, which sent 117,553 tourists to 28 countries in the year 2015, Turkey, Egypt, Spain, Greece, and UAE main destinations in particular, is to serve 200,000 customers in total by achieving 70% growth in the sales of packages and tickets. With 6,390 sales agencies in 151 cities, Coral Travel is the tour operator that has the largest network in Ukraine. The journalists have visited and Expo and Kaleiçi.